E.L.F. Poreless Putty Primer ($8) is a new solid facial primer being hauled as Tatcha The Silk Canvas Protective Primer which actually didn’t have me excited. Why? Because I’m one of the few people that really didn’t like Tatcha The Silk Canvas Protective Primer. I understand the excitement though considering Tatcha’s version is $52 and E.L.F’s is $8 (and a smidge bigger too by the way). I mean if you love Tatcha’s formula why wouldn’t you want an $8 version to save yourself some major cash not to mention if you simply can’t afford $52 bucks or can’t see yourself spending that much on a primer why wouldn’t you want a budget option? Makeup dupes are fairly common in the beauty world and E.L.F.’s always been on point creating cheaper version of the hottest and newest makeup releases. Although, at the moment it’s a controversial topic and many brands are snapping back at brands that aren’t creating dupes so much anymore but out and out copies of products. Anyway, off the topic of makeup dupes I’m sure you’ll want to know how I felt about Poreless Putty Primer. E.L.F. 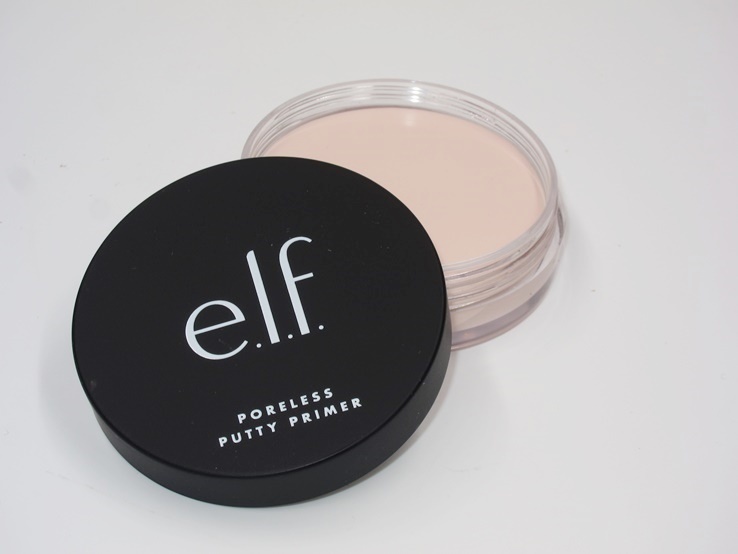 Poreless Putty Primer comes in a plastic container that holds 0.72 oz of product. Packaging is your basic E.L.F. look with the black cap and the clear base. It’s nothing fancy like Tatcha’s version that’s for sure and it also doesn’t come with a spatula or a pick to scoop out the primer where as Tatcha’s does. The lack of a spatula isn’t an issue as I have plenty of them laying around but I think it would have been nice to include one. As I said Tatcha’s packaging is a lot fancier and it a hell of a like bigger. Visually E.L.F.’s packaging is a a lot smaller and Tatcher’s gives the illusion of containing a lot more primer due to this. But Poreless Putty Primer actually contains 0.72 oz and Tatcha The Silk Canvas Protective Primer and 0.70 oz. Packaging aside one of the most important factor are the ingredients and how they compare. I’m not an expert in ingredients but both products do have a lot of the same elements but in different order of appearance such as Cyclopentasiloxane, Glycerin, Water, Dimethicone, Squalne, and Titanium Dioxide just to name a few. I noticed the main difference between the two is Tatcha’s formula contains Hydrolyzed Silk and Silk Powder which is something lacking in E.L.F.’s version. Also, Tatcha’s version contains a lovely fragrance and E.L.F.’s does not. The lack of fragrance will be a win for sensitive users but those who enjoy Tatcha’s fragrance might miss it. Cyclopentasiloxane, Aqua/Water/Eau, Glycerin, Saccharomyces/Camellia Sinensis Leaf/Cladosiphon Okamuranus/Rice Ferment Filtrate*, Hdi/Trimethylol Hexyllactone Crosspolymer, Propanediol, Dimethicone, Ceresin, Titanium Dioxide, Squalane, Dimethicone/Peg-10/15 Crosspolymer, Sericin, Hydrolyzed Silk, Silk Powder, Caesalpinia Spinosa Fruit Extract, Kappaphycus Alvarezii Extract, Yeast Extract, Distearyldimonium Chloride, Trimethylsiloxysilicate, Zinc Stearate, Aluminum Hydroxide, Stearic Acid, Ethylhexylglycerin, Peg/Ppg-18/18 Dimethicone, Peg-9 Polydimethylsiloxyethyl Dimethicone, Polyglyceryl-2 Diisostearate, Biosaccharide Gum-4, Disodium Edta, Silica, Dimethicone/Vinyl Dimethicone Crosspolymer, Parfum/Fragrance, Isopropyl Alcohol, Phenoxyethanol, Mica (Ci 77019), Tin Oxide (Ci 77861), Iron Oxide (Ci 77491). *Hadasei-3. Texture wise these are both a creamy, solid balm that’s light pink in color. I mentioned in my Tatcha review that the texture reminds me of Etude House’s Sweet Baby Choux Base. Don’t let the color bother you though as it does set transparently and doesn’t give a white cast or pasty look to skin. I have dry skin with no visible pores which might be why I failed to enjoy the Tatcha formula. Oddly enough it felt too slippery on my face. It did blur the smaller pores on my nose and did set to a very smooth finish but I wasn’t keen at how it made my face feel greasy. E.L.F.’s formula is almost identical in performance to Tatcha’s. The texture is just as creamy, absorbs easily, and leaves behind a smooth canvas for makeup. I felt like it set to a soft, silky finish and I had no issues with it pilling and it did blur the small pores on my nose. I actually liked the texture a little better than Tatcha’s formula as it was quite as slippery on my skin. My foundation applied flawlessly on top of it. As I said in my Tatcha review this is a thicker layer you’re applying between your skin and your foundation. It’s allowing your foundation to have something to adhere to which allows for not only a smoother appearance but also, it allows your foundation to wear longer as well. I did feel very oily within hours of using Tatcha’s formula but didn’t see as much of the same from E.L.F.’s version although, the oiliness was still there. Like my chin felt very oily and I found myself blotting with powder. This is unheard of for me in the Winter. I wouldn’t say I looked shiny but I did feel a bit greasy. E.L.F. Poreless Putty Primer does perform almost identically to Tatcha’s and in some cases it worked out a little better for me. At $8, it’s worth checking out even if you own the Tatcha version as it could save you a ton of money should you need to repurchase Tatcha’s version in the future. If you liked Tatcha’s version there’s no doubt E.L.F. will be a winner for you! Have you tried E.L.F. Poreless Putty Primer? How did you feel it compared Tatcha’s version? E.L.F. Poreless Putty Primer is a new, permanent facial primer that’s 0.72 oz in size and $8. This solid yet creamy facial primer performs almost identically to Tatcha’s version at a much cheaper price tag. The formula absorbs fully while blurring the appearance of imperfections and extending the wear of foundation without leaving a pasty or white cast on skin. It has a slippery feel which makes it ideal for drier skin without pilling however, as someone with dry skin I felt like it made me feel a little greasy around my chin area but not nearly the greasiness I experience using Tatcha’s version. Very much the same experience you’d get from Tatcha but at a way cheaper price tag. Extends the wear of foundation while giving a smooth appearance. Doesn’t contain some of the “fancier” ingredients that Tatcha’s version does. Gets a little greasy around four hours into the wear but YMMV (your mileage may vary). Keeps selling out (sold out as of this review). Doesn’t come with a spatula or a pick. E.L.F. Poreless Putty Primer is an excellent pick up if you’re interest in a product that performs a lot like Tatcha’s The Silk Canvas Protective Primer but at a way friendlier price tag! This makes me want to go all nerdy and do a half face with each. But since I use waterbased foundation, prob neither would be very satisfactory. This one is going to be a hit>> prediction. Just ordered the e.l.f. putty while it was on sale and anxiously await it’s arrival! I use a spatula because it’s more hygienic. You can buy some from ebay.com sellers or even amazon. They come in 5-10 packs or more plus you can use them for eye creams and other items. Appearance-wise, this reminds me of L’Oreal’s Studio Secrets Magic Perfecting Base – which if I’m not mistaken was one of the first DS primers. Any thoughts on how it compares performance-wise? This is solid and L’Oreal’s Studio Secrets Magic Perfecting Base was a whipped cream texture so that’s one major difference. Honestly, I had f L’Oreal’s Studio Secrets Magic Perfecting Base but I can’t really remember much about the performance sadly. Seems ages ago! I got the e.l.f. putty yesterday but haven’t tried it yet. I’m not going to buy a $58 primer no matter how good it is. Jeffrey Starr gave his approval. Definitely will purchase int eh fire. Their new brow wow product, the brow gel, it also a good match for Benefits brow gel. Elf is really stepping up. I have or have had (I gave away my Tatcha) both and I felt like Tatcha’s *maybe* worked a bit better but I didn’t care for the scent in the Tatcha, and I might just not have used enough of the E.L.F. I’d say it was a happy $8 spent overall. I am curious about this primer. I’m really curious about the Tacha because of the new smaller one!! I have seen it demonstrated as an eye primer too, and it seemed to do a quite lovely job. I might do the E.L.F. one a shot first just for the sake of it being available and not having to do shipping. I don’t think, however, I could handle it if it brings out oils. It’s also a really different kind of primer – I’m not really accustomed to balm types. I did use to use Clarian’s small putty type of filler years ago which (excuse the misspelling) was one the forerunners of primer. Unfortunately, I have spied an eye shadow palette that has caught my eye – like I need another.